Use voucher code 10OFFAPR to get 10% off when you spend £24. Britain’s most useful motorcycling magazine, RiDE is committed to seeking out good value and service for motorcyclists. No matter your experience, a RiDE Magazine subscription will help you make the most of your time on two wheels. Each issue of RiDE Magazine features bike buying advice, in-depth kit tests, fantastic routes to ride in the UK and across Europe, step by step DIY guides and tough road tests. Get your subscription today and make sure you never miss an issue. 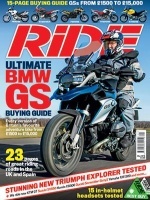 The ultimate BMW GS buying guide, featuring every version of Britain’s favourite adventure bike from £1,500 to £15,000… Stunning new Triumph Explorer tested… 23 pages of great riding roads in the UK and Spain… 15 in-helmet headsets tested… Travel light – tankbag packing masterclass… Fix it, don’t bin it – polish away aluminium scratches… Round the world, down the shops – touch luggage on test… The biking paradise on our doorstep – explore Ireland’s best roads… Ducati Monster used buying guide… How to get music on the move, safely and cheaply… Cool and cheap – the new Ducati Scrambler and six half-price alternatives. Order your RiDE subscription today for more fantastic articles and features like this every month. From novices to experienced motorcyclists, 94% of RiDE readers are men and they have an average age of 48.